I suppose the thing you expect me to say about Regionals yesterday is that we are very proud to have won the first place champions trophy. 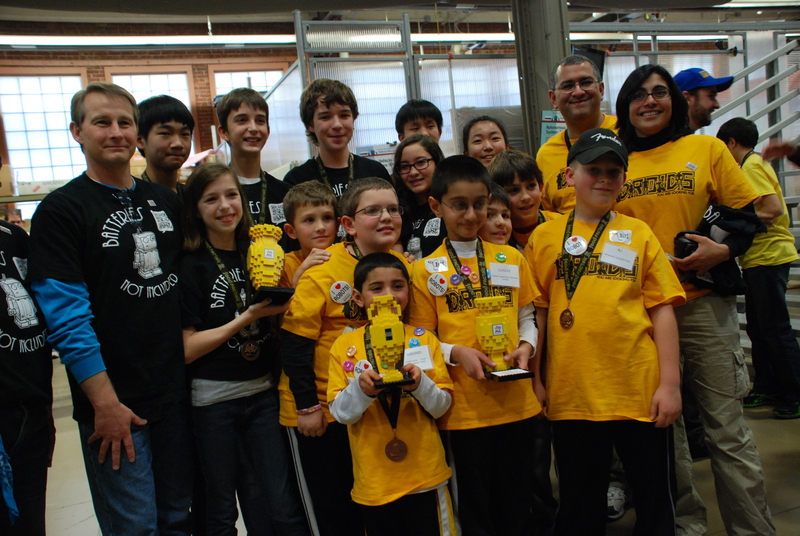 But if FLL has taught me one thing only, it is that the experience is not about the winning. We had so much more fun on competition day this year, and I think it was because we reached and connected to a few other teams. Cheering them on and watching them do well, and having them there to cheer for us (or cheer us up when our robot went astray) made all the difference in the world. It made winning less relevant. The feeling when a very young (and very short) rookie team “Not The Droids You Were Looking For” approached us, thanked us for the Blog, and said that they considered us their mentors! We felt amazed and honored, not only that our Blog worked, but that they were actually looking up to us! BNI became their “fan club” and cheered the loudest when they went on to dominate the table with high scores in the 240s. Watching the table match against the ‘Yo Bots, when right out of the gate, they went for our rat. Strategically, we also went for their rat at the same time. We got each others! All the judges cheered and everyone laughed! I know we didn’t get that extra 15 points, but it was SO WORTH IT. By the luck of the draw, we were at a table next to a coach whose day job involved extensive use of social media and QR codes. He really “got” our project, and was tweeting about us, and the event all day. At one point, someone saw a tweet about us IN SPANISH. Wow. We generated some real attention! Plus they were also huge Monty Python fans, so we had a great discussion about the air-speed velocity of an unladen swallow, African AND European. We had a great exchange about ideas on how to carry our project further. So thanks everyone at the Pittsburgh Regionals! We hope to see you all next year! Go FLL! We sang a song about recalls to the judges. it was to the tune of Portal, “Still Alive” and it was VERY funny. 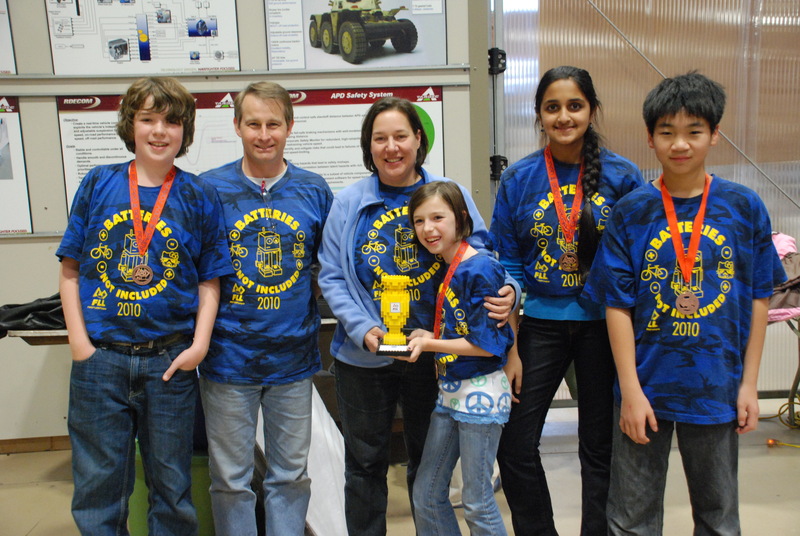 “Not the Droids you are Looking For” winning 1st place for robot performance. Go Droids! Good Luck to everyone at regionals…… Have fun! We are having a great day at Regionals! If you are competing in Pittsburgh, come find our booth. 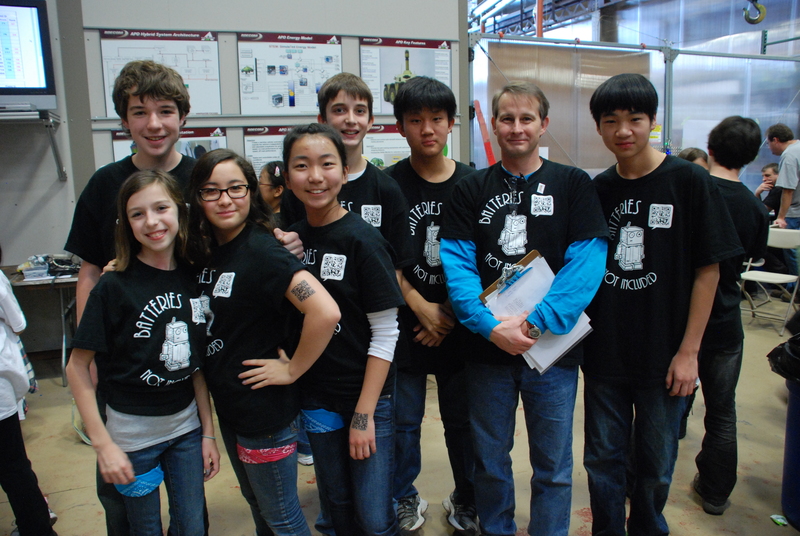 We are Team #6451.We’d love to meet you and see your robot. If you mention you saw our blog, we’ll try to find an extra QR Code Temporary Tattoo to share with you! Good luck one and all! Go FLL! Raise your table to countertop height. Last year we worked on the floor, then when we got to the competition, we were a little flustered to have to change. It never even occurred to us to practice at the right height. Have everyone yell. It will not be quiet and calm at the competition. Try different light. practice calibrating your sensors. We are preparing for a practice session with another local team, the MOS Robo Eagles. Looking forward to pizza with friends, and lots of good idea sharing tomorrow! Due to the large amount of site traffic, we decided to back up a bit and explain what the point of all of this craziness is. The FIRST Lego League (FLL) competition is a internationally recognized event focused on two main parts: the robot game and the project. First Lego League is an education initiative aimed at middle school aged kids to inspire them to pursue careers in science and engineering. First and foremost, it’s a blast. 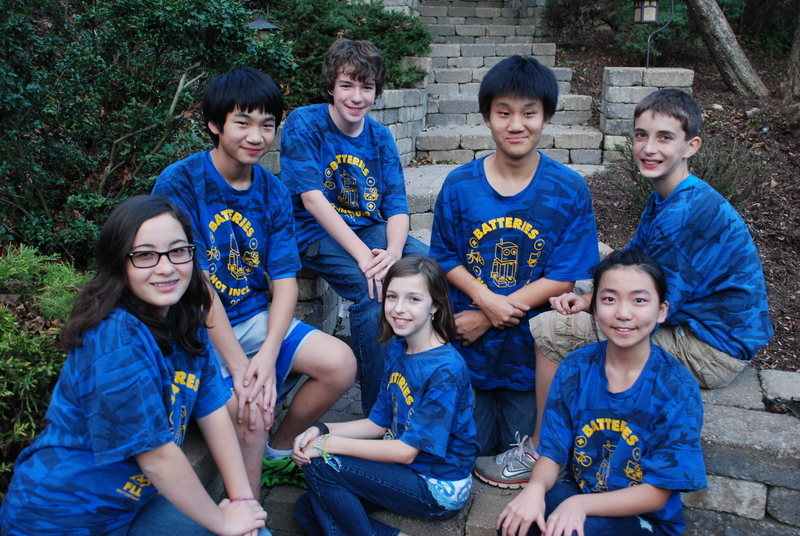 Our team, cleverly named Batteries Not Included, started sometime before last season (September to early December). To be honest, I don’t know much about the founding. I wasn’t recruited for a month afterwards. But apparently a few of my friends got together and ordered the starter kit and went to work. First, let’s back up. 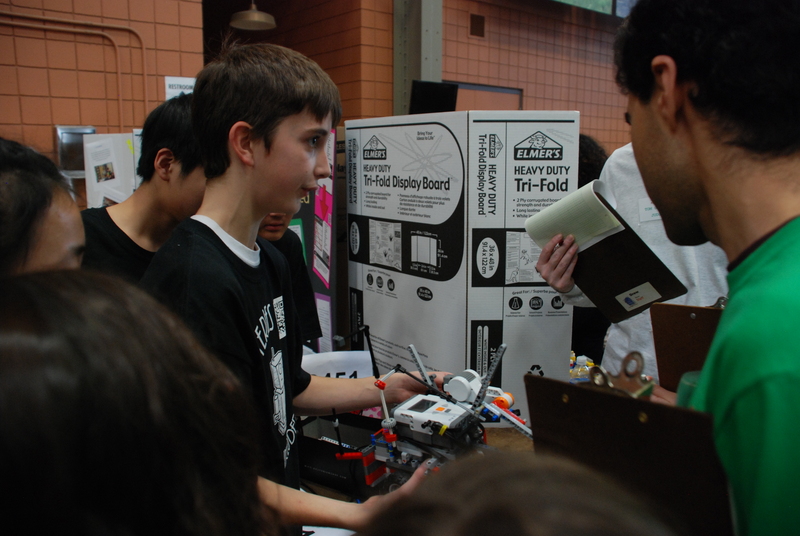 The entire competiton is split into two parts, the robot and the project. The robot is an autonomous vehicle made out of the Lego Mindstorm kit (of your own design) that must perform certain challenges. For each challenge (or mission), your team is awarded points. The team with the most points at the end of three attempts wins. The project is a research project on a predetermined topic (this year’s topic is food safety) in order to design a solution to a problem within the topic. For example, our entry into last year’s bio-medical topic was a filter designed to prevent clots from leaving the heart and causing massive damage. We wrote up a five minute presentation (and a song) and presented our idea to a panel of three or four judges. We ended up placing 1st in the project and 3rd overall. This year’s competition is on December 3rd, so we are finalizing our designs and scripts for the big day. If you want to learn more about our team or the competition, check out the links below. Feel free to like/follow/+1 us on our social media sites! The team democratically declared that coaches had to write an “About Me” post as well, so here I am! This is my second year helping with the team as an assistant coach, and I enjoy it immensely. 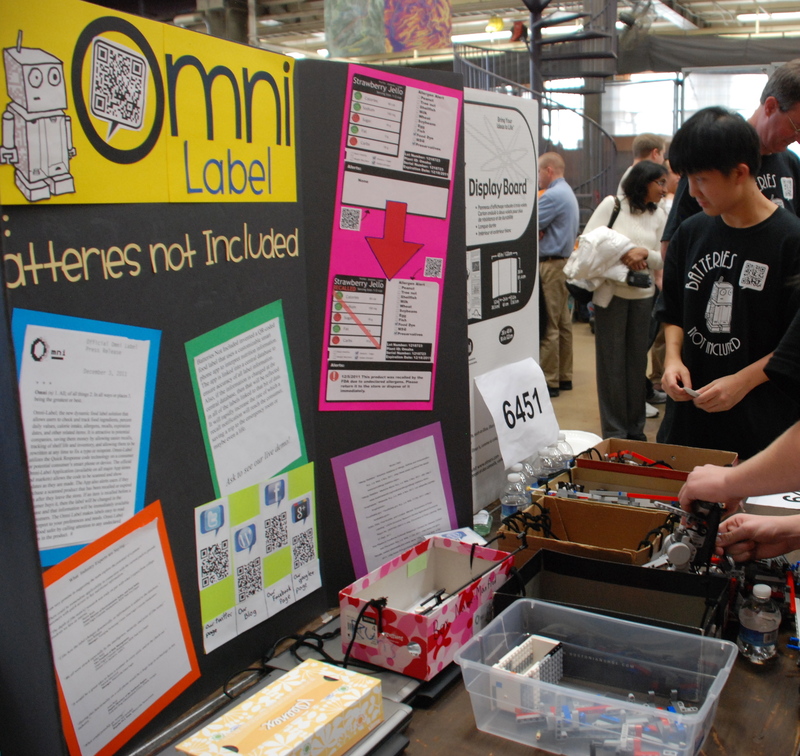 It really surprised me at first that the First Lego League robotics competition was so much more than building the Lego robot and programming its tasks. 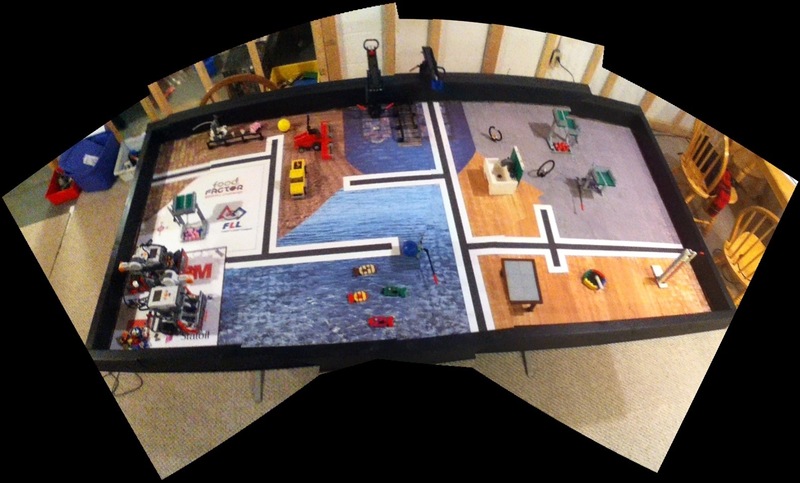 It also really surprised me that doing a team project could be as much fun as the robotics side of it! Who knew! I am a computer engineer by trade, and originally thought I could help the team with the computers and the programming. Well, the kids don’t really need a lot of help programming anymore and they seem to know more about the computers than I do these days, so I have tried to teach them some advanced topics like subroutines, variables, the importance of documentation, source code control, and being organized in general — which is pretty hard to do when seven team members are all working on the same project files! This year, I’ve taken the lead on the project, and am having fun digging into FDA recalls, and the use of QR codes to speed the process. To me, core values means watching these guys figure out something new, applying it at robot team, and then finding a way to apply it in real life. Last year at the competition, I watched in awe as our strongest, most vocal team members graciously deferred judges’ questions to the less aggressive, less confident team members, helping them, prompting them. I was watching them lift each other up, and let me tell you, it nearly brought me to tears. To be part of a team means that sometimes we don’t agree, and sometimes we have to do something we’d rather not, but we do it anyway, cheerfully. That is a life lesson right there. So many times in life at work adults have to do something unpleasant, and we do it with a smile! The kids learn this too, at every single meeting. So thank you FLL, for the opportunity to teach these life lessons to these very bright kids. Thank you for the opportunity to have fun at the competition. Thank you Pittsburgh Robotics Center for hosting our event. 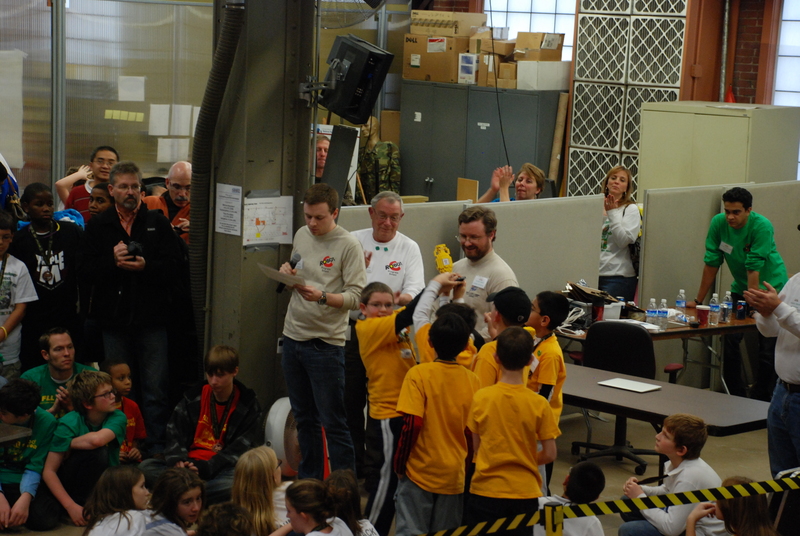 We are having a blast with it this year, and as we know from the FLL core values, when we have fun — everyone wins! Do you know about the Team Profile Sheet? Do you know about the Team Profile Sheet? 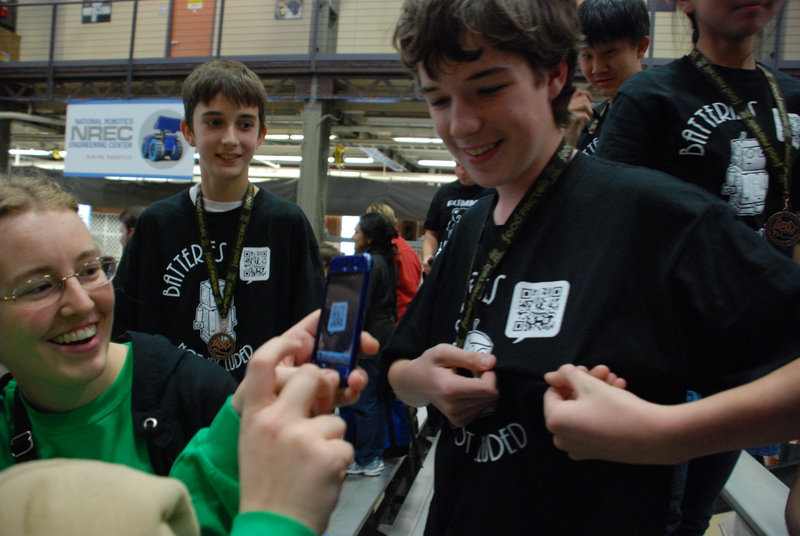 You fill it out with a short blurb about your team, your robot, your project, and take it with you on competition day. It introduces you to the judges, and acts as a reminder of who you are (after they have seen 70 other teams, that is.) We took our team picture today, and it came out kinda nice, even if we were wearing last years’ shirts. Last year, we were editing this the night before the big competition. So we thought we’d point it out to you early this season so that you can get yours ready in advance. You are going to need a team photo, so everyone SAY CHEESE!